It was while we were on honeymoon that it dawned on me just how much I wanted a baby, writes Amy Brook. In a guest post she gives her perspective on the fertility journey. I had come off the pill and we had actively started trying (I hate that phrase, but you get the gist). I got my period the day before we flew home and for the first time I felt that pang of disappointment. I’m sure any woman reading this knows the feeling. Little did I know that I would experience that same feeling each month for the next two years or so – only as time went by, the disappointment became greater and the tears became increasingly bitter. I am lucky to have a supportive family and a close circle of friends who are basically an extension of my family. They said and did all the right things, but there were very few people I could talk to who could actually relate to what I was going through and, at times, I felt alone. But as I opened up about our struggle I discovered that two old friends were in the same position. Talking to them, and having someone understand how I was feeling, was incredible. I felt like my body was failing me, that it wasn’t doing what it was supposed to do. Whenever I was feeling overwhelmed or emotional I could turn to them, vent and they just got it. The mutual support that people who are struggling to conceive can offer each other is remarkable. Even though everyone’s experience is different, just being able to talk openly and have someone understand helps. My husband Tom is naturally optimistic and was confident that I would fall pregnant eventually, even if we did require a little help. I, however, am more pessimistic and started to overanalyse everything. It’s my job as a journalist to read between the lines and consider not just what’s being said, but what’s not being said. I was thinking about why I wasn’t falling pregnant and wanted tests to get to the bottom of it. My husband and I saw our GP and had several routine tests. Tom’s sperm was fine and nothing showed up as a problem with me. On the advice of my doctor, I paid to have a hysterosalpingogram because if a problem presented itself I could then be referred for IVF. It came back clear and the mystery continued. After two years of trying to conceive my GP told me he’d refer me to my local hospital for a test to see if I had a “hostile environment”, in other words to see whether my cervical mucus was attacking Tom’s sperm. After that, I was told, I could be referred for IVF on the NHS. The hospital consultation took a surprise turn when the doctor told me that he wouldn’t do the test, and questioned its effectiveness. He also said that because I was in the unexplained infertility category I’d actually have to wait three years before being offered IVF on the NHS. At that point I broke down and told him that, with respect, I thought he was wrong. I had been told by my GP that I’d be given help after two years of trying to conceive. The NHS website at the time said patients under the age of 35 who had been trying to conceive for two years could have three rounds of IVF. I actually pulled up the webpage to show the doctor. He said I had been misinformed by my GP because in my situation, and specifically in my area, I’d have to wait a further year before qualifying for it. He also showed me the NICE guidelines the hospital followed, although by that point I couldn’t focus properly. Moving the conversation on, the doctor told me that my chance of conceiving naturally was very low. He handed me leaflets on a private IVF practice and said it was something to go home and consider. I remember sitting there, feeling like a lead weight and numb. I cried. A lot. And then I decided that I had to take some control of the situation. I went back to my doctor to relay what had happened and complained to the NHS about the information on its website, which made no mention of that fact that not everyone is offered the same help. The fact is, it’s a postcode lottery as to what’s provided in each area. I want to add at this point that I think the NHS is an incredible organisation. I’m a huge champion of it, and its phenomenally dedicated staff, but for the first time I felt let down by a healthcare system that was meant to help people. Just because I didn’t fit into a neat category I would have to wait a further year before being offered IVF. If, for example, Tom had a low sperm count or another identifiable problem, we would have qualified for it there and then. In my opinion, we did have a problem because I simply was not conceiving, but nobody knew what it was. It was Tom who did some online research on the clinics with the best success rates and came across Bourn Hall. When I called and heard a friendly voice I cried. I’d been so used to engaged phone lines and answer machines that to get through to someone warm and helpful felt brilliant. An appointment was made and the adventure started. Before our consultation I read every single case study on this website and felt comforted and hopeful. Here were people who’d attended the same fertility clinic, faced similar conception obstacles to us and defied the odds by becoming parents. I wanted to know more about the people in this position. That’s what inspired my website, IVF Stories. Everyone’s experience is different, but the things that unite us are the same. We all need help and we all want to be parents. As my role as founder and editor of IVF Stories, it’s my job to share people’s experiences – the good, the bad and everything else in between. I want to inform and inspire people undergoing fertility treatment. You won’t find anyone trying to scare you on the website, nor will you find anyone prophesying about your chances of conceiving. That’s an expert’s domain, not mine. What I hope you’ll find is genuine support and revealing stories that give you an insight into IVF that you may not have been privy to before. 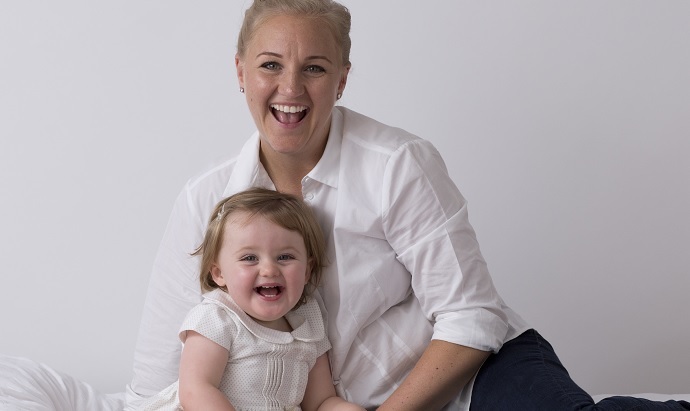 I know that in conceiving our daughter, Florence, after our first round of IVF at Bourn Hall we were incredibly lucky. That feeling has never tempered down over time. I know we beat the odds and, in our eyes, the fact that we made a perfect, healthy little girl is a miracle. Just thinking about what the team at Bourn did for us makes me cry. Hand on heart, I remember standing in the car park saying to Tom: “They’re going to help us get our baby. I just know it.” I can’t explain why, but I just felt it. In many respects, everything we have we owe to them. For more information about NHS funded IVF, click here. For more information about IVF treatment, click here.